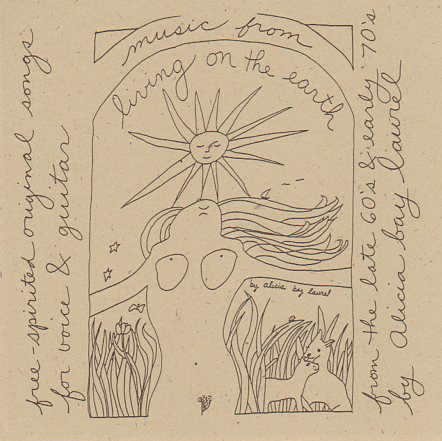 Posted on September 4, 2007 by Alicia Bay Laurel	in Blog and tagged travel diaries. 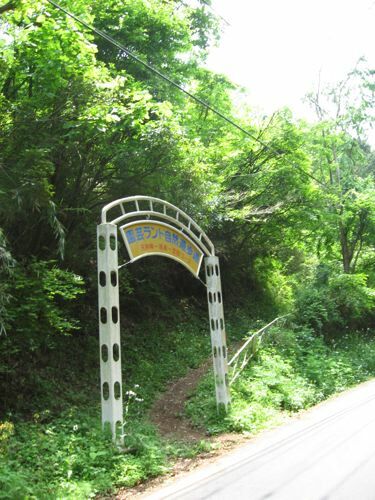 In the morning of my last day in Fujino I took another walk using a map made by Setsuko, on a road going over a mountain pass and into another valley. From the top of the pass, I could see the Steiner School, and Lotus House quite near it. 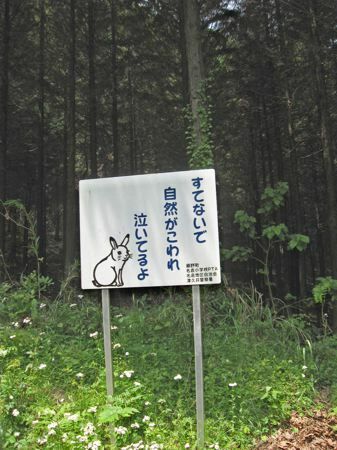 A roadside sign with a bunny, probably about protecting the local wild animals. The entrance to the ridge trail was well marked. I was sorely tempted, but I knew I didn’t have time. 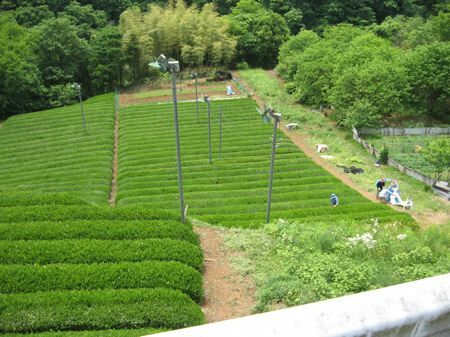 As I descended into the next valley, I passed a busy tea farm. The owner saw me taking photos and came over and invited me to come into her home to drink some of her tea. I knew I was expected soon for lunch with friends back at Lotus House, and thanked her and did my best in my limited Japanese to explain why I couldn’t stay. I was stunned by the kindness of her offer to a mere passer-by. 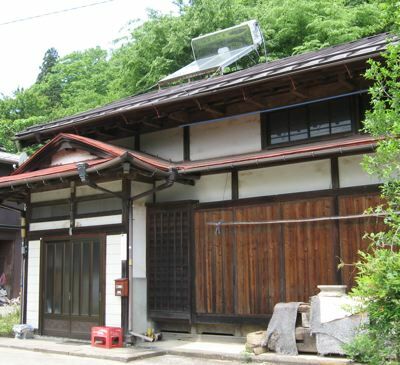 The tea farm owner’s house was traditional Japanese in style, but it had a solar water heater on the roof. 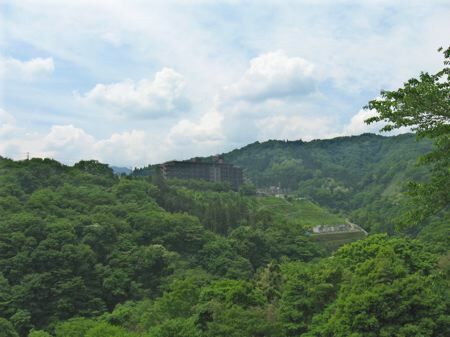 Down the hill further, I got a view of Fujino’s mountain hot springs hospital. What a splendid idea. 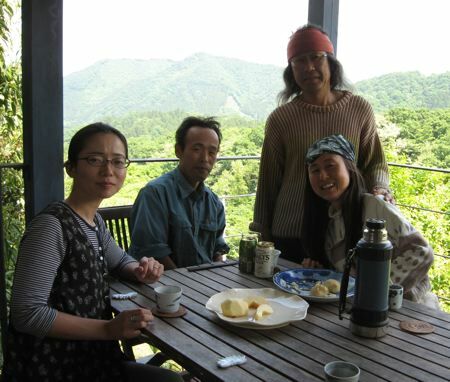 When I returned to Lotus House, Setsuko and Jun created yet another a gorgeous luncheon on their porch, and invited over their neighbor Tomoko, the television director, and Yamazaki, a holistic healer who treats patients with acupuncture and moxibustion, teaches natural diet, and owns and runs an organic farm in Fujino from which he supplies local subscribers with weekly boxes of fresh vegetables. 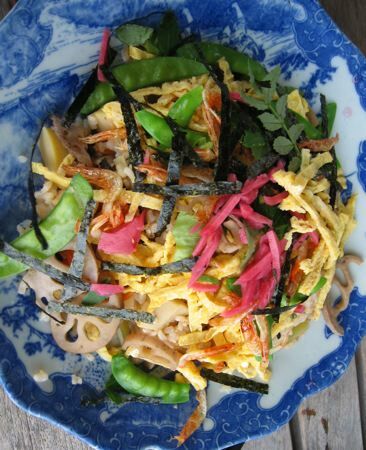 Jun prepared an elaborate rice dish, with strips of fried egg, nori, and pink pickled vegetables, slices of lotus root and bamboo shoot, whole peapods, and whole tiny fried shrimp. 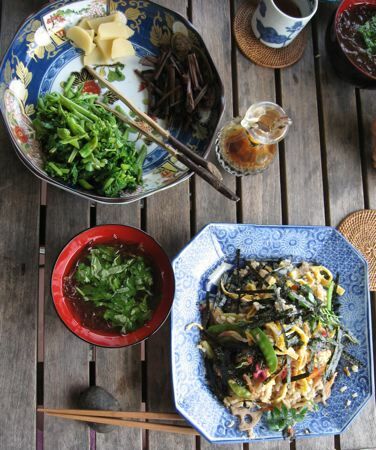 This amazing dish was accompanied by miso soup with chopped garden greens in it, plus a selection of cold cooked vegetables. 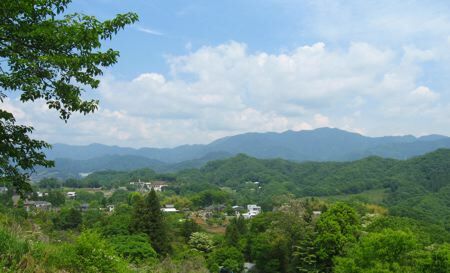 After the delightful meal and visit with my new friends, I thanked Setsuko and Jun profoundly, and packed up the last of my bags. Jun drove me to the train station; an hour later I was changing trains in Tokyo, and heading out to the beach town of Hayama.